Building an integrated care delivery model that improves care for underserved communities. Possible is a global partnership that improves healthcare for underserved communities. Possible includes Nyaya Health Nepal (a Nepal-based NGO), a US-based nonprofit, and technical advisors. Currently, we work in two districts: Achham in the Far-West and Dolakha, which was devastated by the 2015 earthquakes. Our more than 380 staff provide integrated care from home to hospital to over 200,000 community members, provide over 150,000 hospital visits, and conduct over 8,000 surgical procedures annually. We leverage our work as integrated care providers to build, design, test, and scale solutions that improve population health in Nepal and beyond. (3) an integrated electronic health record to optimize care between the facility and the home. We use our data, research, and experience as a healthcare provider to inform local, national, and global healthcare policy and practice. The goals of this model are to improve health outcomes for an entire population. What is unique about Integrated Care Delivery? Integrated care delivery puts patients at the center of its design. Over the past 10 years, we have seen that the most innovative private hospitals don’t work, because high costs prevent many patients from seeking preventative care and follow-up. Community Healthcare models, alone, don’t work, because Community Health Workers are not equipped to diagnose or treat acute conditions. 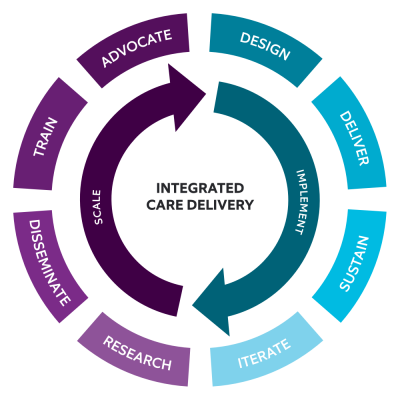 Integrated care delivery recognizes that improving healthcare requires a longitudinal approach that involves data collection, analysis, and learning at every level of the care delivery, both in facilities and in the field. Our approach leverages the scale, infrastructure, and accountability of the public healthcare system. And it accesses philanthropic resources towards innovation and global best practices.